On Wings of Eagles: Where is Your Treasure? The oil boom in Oil Creek was feverish. Men went out to make a fortune, and nothing would stop them from becoming rich! And they never gave a second thought to the environment. After all, did it really matter that gushing wells covered the ground with a black mire of oil and mud? Was it worth worrying that there weren't enough empty wooden barrels to catch the oil, so it leaked freely into ponds? Who cared anyway about the smoke from the burning gas that clung to the little mining towns, or the oil spills that at times even burned up the creek! They would be rich! When, after just fifteen years, the oil ran out, these same people left the dilapidated mining towns and the ruined environment behind. They had taken all of the valley’s vast natural resources, leaving nothing but emptiness, pollution, and desolation behind. Where those who pretended to be rich satisfied after their endeavors? Most of them spent their hard-earned, polluted stash within a year, and many left the region penniless. Riches don’t last! Just ask most lottery winners! That devastated land healed itself over time. Little by little, plants began to grow again, and pollution-tolerant weeds took hold in bare fields. Naturally, they all died in the fall of each year, and in their decay, they enriched the soil, readying it for other less-hardy plants, and later, even trees. As soon as the plants were once again thriving, the wildlife returned, and the present-day valley is not only beautiful and fertile, but once again rich with wildlife. There are still remnants from the greedy prospectors, however. Upstream at Boughton, Pennsylvania, sulfuric acid became leached into the ground, making it impossible, even now, for plants to develop. This reminds us of the story of the rich young ruler (See Matt 19:16-26). When he left Jesus, he had a mile-long face. We also know that riches will never procure us happiness. Possessions are fleeting, and for those who hold on to their monetary kingdoms, their worries vastly surpass their earthly goods! Truly we are the ones who are rich, as we will inherit a place in paradise, where we will enjoy the full extent of the presence of the One who makes us abundantly rich! And there aren't even any harmful effects on the environment! “Listen, my dear brothers: Has not God chosen those who are poor in the eyes of the world to be rich in faith and to inherit the kingdom he promised those who love him?” (James 2:5 NIV) Being truly rich is relative to your point of view. There is earthly richness, which flees like shadows, and there is divine richness, which fills our hearts. Are your treasures stored up in heaven? 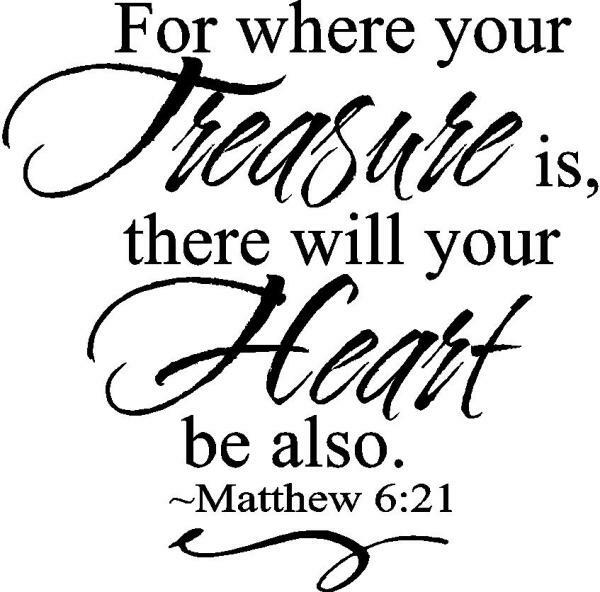 Dear Lord we pray today that we wouldn't focus on the treasures of this world but that we would focus on the things of heaven. In Jesus’ Name, Amen.